Two-factor authentication is a feature that adds an extra layer of security when logging in to your Lokalise account. Two-factor authentication is a feature that adds an extra layer of security when logging in to your Lokalise account. After entering your login and password, you will be asked to provide a verification code displayed on the Google Authenticator app installed on your mobile. Once Google Authenticator is installed, click Set up. You will be prompted to scan a QR code and asked to enter a security key provided. 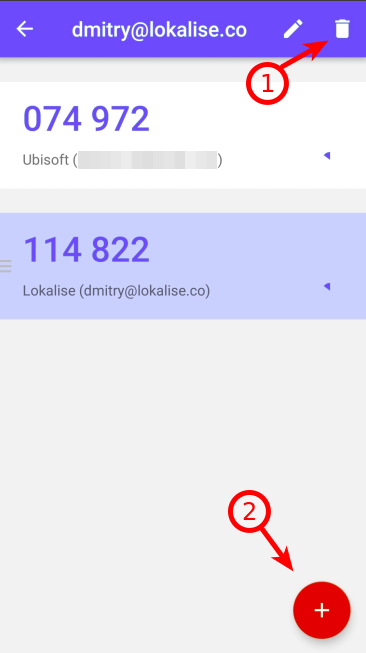 As soon as the two-factor authentication is enabled you are required to enter a code from the Google Authenticator app every time you log in to Lokalise. If it is required, you can deactivate two-factor authentication by going to the two-factor auth tab in the personal profile. Click the Disable two-factor authentication and proceed. Note: Once the deactivation is done, launch Google Authenticator on your mobile phone and delete the row displaying the Lokalise verification code (see below). How do I log into my account if I do not have access to Google Authenticator? If you have enabled two-factor authentication for your Lokalise account and unable to access Google Authenticator, you can still use one of the three recovery codes provided during the two-factor authentication setup and activation process. If you have lost or already used all your recovery codes, you will need to contact Lokalise customer support to regain access to your account. How can I get my recovery codes? Your recovery codes are available in the personal profile settings. Please make sure you save and store them properly. If you have lost your codes, please contact Lokalise customer support to regain access to your account. Do I have to pay to use two-factor authentication? Two-factor authentication is a completely free feature. No payment is required to install Google Authenticator or activate two-factor authentication on your Lokalise account. How do I move my two-factor authentication to a new phone? Log into the Lokalise account and open the personal settings. Activate two-factor authentication using Google Authenticator on your new phone. I scanned the QR code but the verification code displayed on Google Authenticator does not validate the synchronization. You can now try the new verification code displayed on the Google Authenticator app. If it still doesn’t work, please contact Lokalise customer support.